Limited Edition Premium quality resin bobble head. 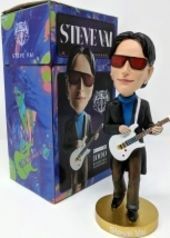 The latest bobble figure in the Guitar Gods series is none other than legendary guitar virtuoso Steve Vai. This figure representing the musician is limited to 1000 numbered units, stands at 7 inches tall, and is made of a lightweight polyresin.